The kids are back in school and we can all breathe a sign of relief. I LOVE having my boys home in the summer, but I’m thankful for the school year as well. I’m not torn trying to spend time with them and keep one eye on work at the same time. I keep saying that I’m going to get WAY ahead so I can just take off the entire summer, but it never seems to work out like that! So, here we are. Fall fast approaching and that means winter is coming. And since winter is coming and we are organized beyond measure, cough, cough, we’re going to get a jump start and be prepared this year. Are ya with me? So, let’s talk getting our homes ready for Fall. The lovely, crips autumn leaves that drop covering your lawn and inviting you to hours of back-breaking, blister-inducing work. fun-filled playtime. Are you ever caught unawares by the propane tank getting dangerously low or maybe, a winter storm hits and you forgot that your snow shovel broke last winter when your kids mistook it for a handled, racing sled? Not this year. 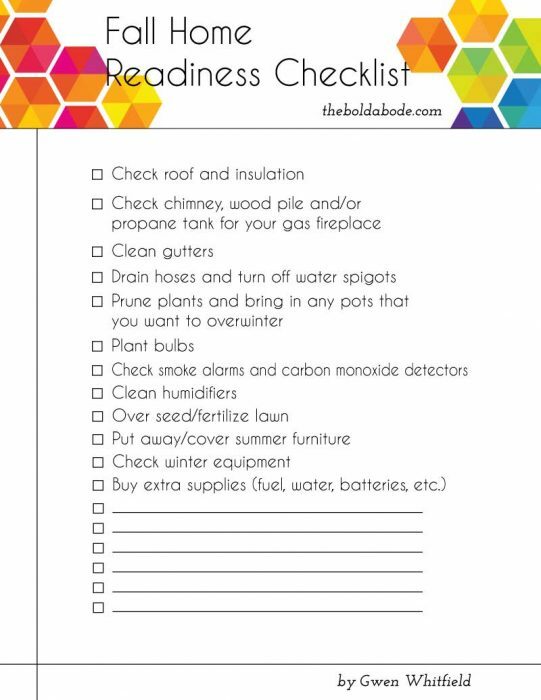 This year, we’re going to get ahead of the game and get in gear with this FREE Printable Fall Home Readiness Checklist. But first, let’s take a look at what we need to do to get ready for the cooler weather. One of our first years here, we had a terrible winter storm. It was certainly the worst I’ve ever seen, and supposedly a record for this area. Being new to this part of VA, we weren’t sure about that, but after 8 years here, I now know they were all tellin’ the truth. Anyway, we didn’t have enough insulation in our attic, thanks to our builder, and our real estate agent (but that’s another story for another time), and we had a terrible ice dam. Now, if you’ve never heard of that, basically what happens is that ice freezes on your roof, melts in the sun, refreezes, melts and continues on until it creates a dam and causes a leak in your roof. It’s not super common, in that it’s never happened to us again, so it’s kinda like the perfect storm. Read what This Old House has to say about it here. My point is, be sure and do a visual inspection of your roof and make sure you have your home properly insulated. Hire a professional if you aren’t sure about it. It’s much better to spend a little money now, than deal with a week of giant, professional grade fans blowing through your home with half-ripped up wood floors. I love a warm, wood fire. Unfortunately, we only have a gas fireplace. Fortunately, we have a gas fireplace. ha. But now is the time, no matter what you have, to check on it. Make sure your chimney is in proper working order so you don’t have a giant smoke bomb in your face the first time you fire it up. And be sure you have wood and /or propane stocked and ready to go for those cold winter nights that call for smores by the fire! Leaves fall. On your lawn, but probably also right into your gutters… if you don’t have guards on them. So, take a day to make sure your gutters are all cleaned out and ready for the winter season! Ok. This is one thing I will NOT forget to do this year. For a couple of years, we’ve forgotten to disconnect our hoses and I ended up one spring with a lake in my office. Hence my ripping out the carpet and painting the concrete floor. The water stayed in the spigot pipe, froze and busted. You’d think we’d have learned the first time around, but I guess we’re a little thick in the head. So this spring, we hired a professional to fix the broken pipe. Believe me, we tried and tried to DIY it, but plumbing can be a pain in the rear. It was just one of those things that finally became worth it to us to pay someone to do it right. Now we just have to remember to drain it and turn it off at the emergency shut off valve. And with this checklist, I won’t ever forget again! 5. Prune plants and bring in any pots that you want to overwinter. This summer, I’ve kept my plants alive. I can’t believe it! So I’m going to bring some of them inside and try, try, try to overwinter them. I’ll be doing more research on that soon. I’m a total newbie. I’m hoping I can keep my green ferns alive, but we’ll see! Don’t you just love daffodils? I do, too. But I keep forgetting to plant some bulbs. I want to put some around both of our trees and in our flower beds so we’ll have pretty little blooms in the spring. This is THE YEAR! This is super important and will save your money on your utilities for sure. Make sure all your doors and windows are sealed properly so you don’t have any cold drafts blowing on you and your sweet family while you’re cuddled up on the couch, biting your nails as Rick and Neegan go at it! Batteries save lives. Nuff said. We have two or three humidifiers that get plenty of use in the winter but sit in the closet the rest of the year. Now is the time to get them down and wash them out so they are ready to go when the sniffles start! Who wants to be washing them when your nose is running an ultra marthon right down your face? I hear fall is the best time to seed your lawn. So check that out. Our lawn is half grass, half clover. This year, Morgan is planning to aerate and over seed in the hopes that it will grow and choke it out. I’m optimistic. Go grass! This we have to do. Particularly for our grill. We’ve never had a cover for it and it’s starting to show. Make sure your snow shovels and other winter tools are in good shape and ready to get some use over winter. Check and see if snow boots and suits still fit and whether or not you need to order new ones. Thick socks and gloves and hats tend to disappear here and we run around scrambling for them when the snow decides to grace up with it’s presence. Checking them now will save a ton of heartache and cold fingers! Go ahead and get some extra gasoline, batteries, water and food supplies before the first storm hits! If a single flake floats down here, Kroger is covered up and finding bread, milk and water is pretty much impossible. Stock up a little now so you don’t have to get out in the snow. Unless you just like to go driving in the ice. Morgan, I’m looking at you. Now we have no excuse! So grab the Checklist down below. Just fill out the form below and I’ll send the free Fall Readiness Checklist Printable asap! Get your home ready for fall and winter with this free Fall Home Readiness Checklist! Success! Check your email for the link to download your Free Fall Readiness Checklist and confirm your subscription! I'd like to receive the free 10 Week Series of Gold Foil Printables as well!